In this tutorial we will show you how to install Gallery3 on Ubuntu 14.04. For those of you who didn’t know, Gallery3 is an open source photo sharing web application, based on PHP and MySQL. Gallery 3 has intuitive photo management administration and you can use it into your own website no matter whether you’re running a small personal site or a large community portal. This article assumes you have at least basic knowledge of linux, know how to use the shell, and most importantly, you host your site on your own VPS. The installation is quite simple and assumes you are running in the root account, if not you may need to add ‘sudo’ to the commands to get root privileges. I will show you through the step by step installation Gallery3 in Ubuntu 14.04 server. Step 3. 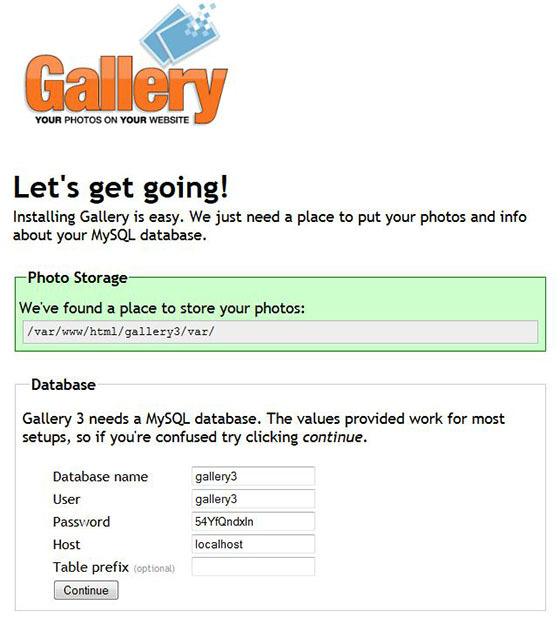 Configure MySQL Database for Gallery3. Gallery3 will be available on HTTP port 80 by default. Open your favorite browser and navigate to http://yourdomain.com/gallery3 or http://server-ip/gallery3 and complete the required the steps to finish the installation. If you are using a firewall, please open port 80 to enable access to the control panel. Congratulation’s! You have successfully installed Gallery3. Thanks for using this tutorial for installing Gallery3 in Ubuntu 14.04 system. For additional help or useful information, we recommend you to check the official Gallery3 web site. Related Posts of "How To Install Gallery3 on Ubuntu 14.04"